Okay, so you’ve written a killer job ad, compelled a superstar future employee to apply; that is, until they see your initial application. Here at ApplicantPro, one of the most highly regarded features of our platform is our reporting metrics. These metrics speak volumes about every step of your hiring process including your initial application. You see, we track an applicant’s experience from start to finish and we can identify wherein your process may be experiencing hiccups based on the path of the applicants. One of the most telling pieces of this cycle is the data relative to the initial application. Quality candidates know their worth. Most HR professionals would look at graphs showing a high number of applicants clicking on the job ad to apply, but quickly backing out as soon as they see how much of a marathon they’ll be running when trying to complete your bear of an application, as a positive thing. They think to themselves, “We only want applicants who are dedicated to our company to apply!” The applicants who don’t make it through the “gauntlet” aren’t worthy of applying and I don’t want them to complete an initial application anyway, right? Wrong. Quality candidates know their worth. If they’re a top tier employee, they’re likely already employed or will have five offers on the table by tomorrow. Really, what you include in your initial application says more about you than it does them. 1. In the initial application, skip the social security numbers. How many of you have ever received a dreaded email that reads something like this: “We at XYZ company value you as a customer and your safety is our number one priority which is why we wanted to let you know that we may have experienced a data breach. While we doubt you were affected, we suggest that you change your username and password as soon as possible. Signed CEO of XYZ.” This happens a lot. Especially now that everything we do is managed electronically. The more often this happens, the tighter security reins get and the less comfortable people feel sharing this information. I’d like to ask you a serious question. Why do you need an applicant’s social security number in the initial application? What benefit does it serve? The reality is that most applicants are going to be leery of sharing such personal information in the initial application because they have about a ten percent chance that you’ll ever even contact them for an interview. While we’re at it, you shouldn’t ask for a date of birth or a driver’s license number either. If you’re a company a job candidate has never heard of, you could be using that information to steal their identity. This was a common scam in Russia a few years back. Technically speaking, you don’t need it until you’re wanting to extend an interview offer anyway, right? That gives them peace of mind knowing that you’re at the very least a “real company” and it also helps you because your company doesn’t have to sit on protecting the identity of thousands or tens of thousands applicant’s identities. 2. Don’t ask for references on the initial application. References are something to be coveted. Chances are, we’ve all had to use them at some point and if you can take a second to reflect on how you felt using your references, you understand just how much value they hold. You know that when you list someone as a reference, especially in a professional capacity, you’re asking them a big favor to take the time to discuss your skills and your offerings to another person. They aren’t something you flippantly burn through. References are something to be coveted. So, why would you bother asking for references in the initial application? 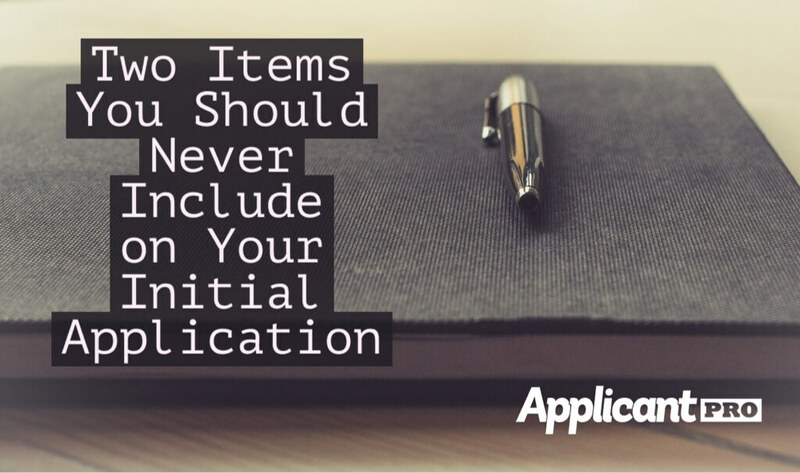 Especially when we assume that only a fraction of the applicants who complete the initial application will progress beyond that step and secure an interview. There’s no reason for you to ask for references on the initial application because you don’t need to know that information until you at the very least meet that person face-to-face, right? Another angle to consider is that a lot of references people list on the initial application when prompted are employees at their former or current place of employment. If your applicant is currently employed (which a lot of killer candidates are), they would be risking a lot by sharing references at their current place of employment if they haven’t made the decision to quit their job. Does your initial application need an overhaul? We can help! And we can do it free for thirty days. Give us a call to get started, today.